Importance. 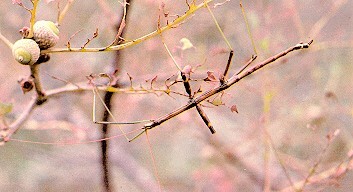 - The walkingstick attacks oaks and other hardwoods. In the South, severe outbreaks have only occurred in the Ouachita Mountains of Arkansas and Oklahoma. Branches are killed or die back in heavily defoliated stands, but continuous defoliation for several years can result in mortality. The insects create a nuisance in high use areas such as parks and recreation sites. Identifying the Insect. - Nymphs and adults are slender and have long thin legs and antennae. While motionless, they closely resemble their host. Adults are about 2 1/2 to 3 inches (62 to 76 mm) long, and their body color varies from brown to green to multicolors of gray, green, and red. Identifying the Injury. - The entire leaf blade, except the base of the stout veins, is eaten. During heavy outbreaks, large stands are often completely denuded. 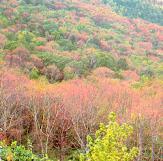 Trees may be defoliated twice during the same season. Because the walkingstick does not fly, infestations are often localized and spread only a few hundred yards during the season. Biology. - Overwintering eggs in leaf litter hatch in May and June. Nymphs become adults during the summer and fall. Females deposit up to 150 eggs, which are randomly dropped to the forest floor. There is one generation per year in the South, while 2 years are required farther North. Control. - Natural enemies, particularly birds, are often effective. Chemical control is occasionally warranted in high use areas.